Are you ready for a homemade jam recipe with the Instant Pot?! When it comes to homemade food, there is something more than just the fresh taste and nutrition that you get out of it. It is even more so when it is a dish that you have always bought in stores in the past and never tried making it on your own. The homemade jam recipe that I am sharing today is one such recipe. 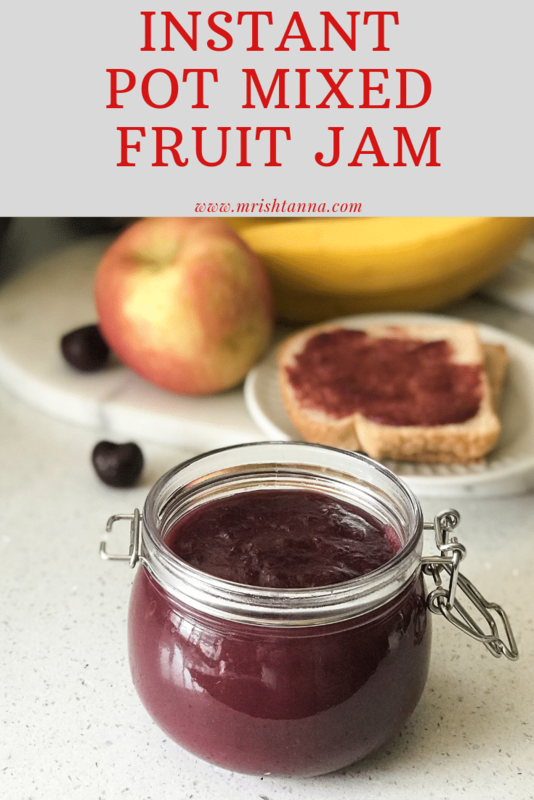 I have tried a few versions of homemade jam, but this is by far the best homemade jam that you can make in Instant Pot. Needless to say, I am a big fan of the Instant Pot and I have tried several dishes with it, but never really thought of using it to prepare the homemade jam. It is really a lot easier than you think. I made Strawberry Jam and Berry Jam and both turned out very good in the Instant Pot. This recipe is for mixed fruits version that my kids always crave for. The result was just too good to be just reading about. You’ve got to try it today! Why Should You Prepare Jam With The Instant Pot Pressure Cooker? Homemade jam recipe takes a longer time to cook on stove top. With an Instant Pot, it takes less than 30 min. Another reason to use the Instant Pot is that you use fewer pans to prepare it. That means fewer dishes to wash and less of a mess! What is good about this homemade jam? Look at the ingredients in Jam or jelly at any store and you will find the ingredient called “Pectin”. Although it is a natural ingredient, it is added in relatively larger proportions to thicken the jelly. The homemade jam is made without using commercial pectin. Just the amount that is naturally available in berries and apples. Not only that, this homemade jam recipe made with little sugar. All the sweetness is from the fruits and little sugar. You could also prepare this recipe with agave syrup or no sugar if you pick and choose fruits that are not sour. Jam can be made with Agave syrup or Maple syrup instead of sugar. Replace the sugar with 3 tbsp of agave syrup and reduce the juice quantity or increase the cornstarch quantity to thicken the jam. Instead of cornstarch, you can add chia seeds to thicken the jam. But my kids do not like the chia seeds in the jam. 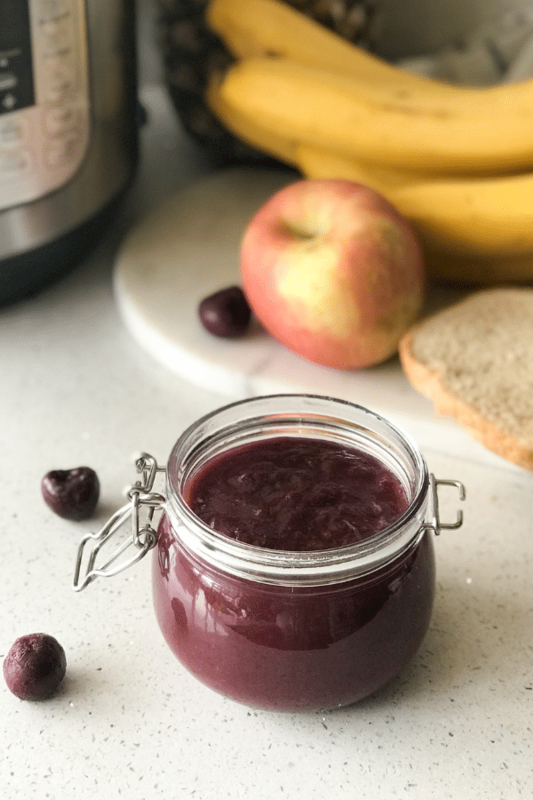 For this instant pot jam recipe, I used pineapple juice. You can use any kind of fresh juice for your recipe. Homemade Jam can be stored in the refrigerator for up to three months! Just be sure to store them airtight and that it remains dry. Always use a clean and dry spoon to scoop them. There is virtually no limit to the variety of fruits that you can add. I used banana, apple, mango, frozen cherries for this recipe. I also added a pod of cardamom during the process to add some aroma. If you choose to do it, be sure to take them out before you proceed to mash the fruits. 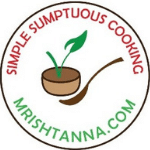 If this recipe interests you, look for similar recipes in my blog such as tomato jam. For more delicious vegan recipes such as this sent directly to your inbox, just subscribe to my newsletter. You will also get a copy of my e-book where I have put together some simple vegan dessert recipes and dessert essentials. My readers have found it very helpful and I am hoping you will too! 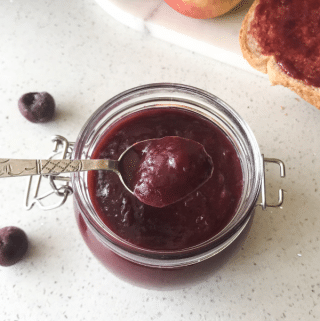 Easy Homemade instant pot jam is made without pectin. This jam is quick, delicious, spreadable and kids favorite. Peel the skins of mangoes and banana and cut them into cubes. Finely chop all the other fruits. If you are using any frozen kind, let them thaw to room temperature for at least 10 minutes. In the inner pot, put the chopped fruits, ½ cup sugar, and ½ cup pineapple juice, cardamom pods. Close the lid and set the pressure valve to the sealed position and set the timer for one minute. Release pressure naturally for at least 15 minutes. DO NOT flip the pressure valve. Release the pressure valve carefully and remove the lid. Using a hand blender or a masher, blend/mash the mixed fruits until all the fruits chunks disappear. 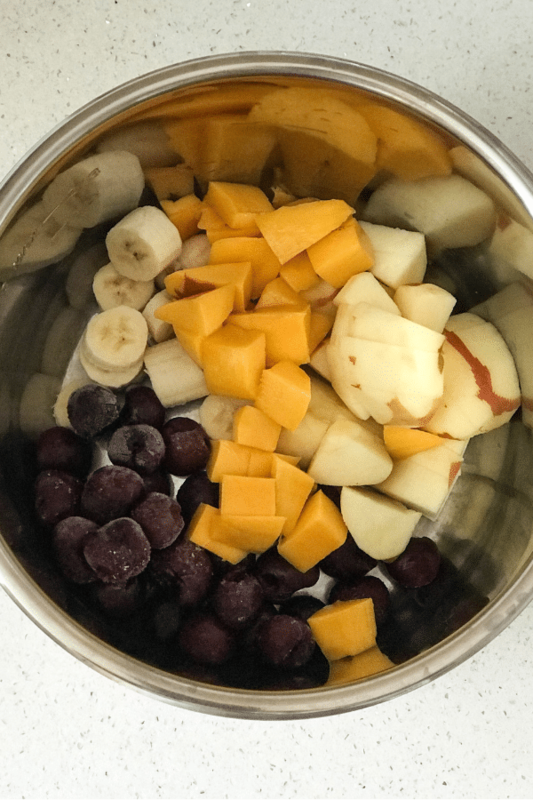 Turn Instant Pot to 'saute' function and allow the mashed fruits to come to a simmer/boil. Let it simmer for 5 minutes or until the mixture thickens. Turn the instant pot off and allow mixture to cool down. Mixed Fruit Jam is ready! Store it in a dry mason jar and refrigerate! I love that this is an instant pot recipe! My kids love toast with butter and jam in the mornings, so this recipe is a must-try! Thank you. I would never have thought you could make jam in an instant pot. I always thought it was one of the things that needs constant attention and stirring. Also never heard of mixed fruit jam! Oh I love how you mixed all those fruits! I bet it must taste amazing!!! I really need to make this since there is not one fruit on your list that I don’t like. Thanks for sharing Uma! I love mixed berry jam! It’s such a great way to use up the last bits of fruit. This jam over some ice cream sounds perfect! Pinning for later! I love that you make this jam in the instant pot. I never thought that was possible! And I think they only thing I’d do differently is make it with chia seeds. Your jam looks so delicious! So healthy and delicious! 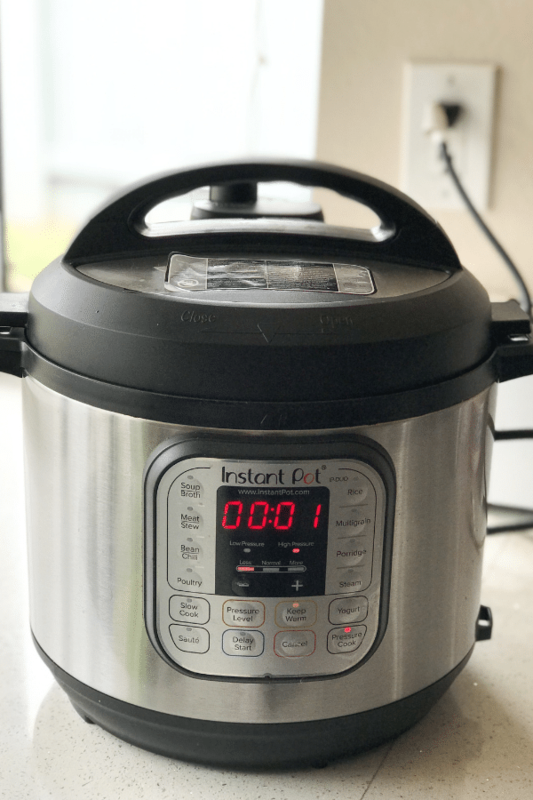 What a great Instant Pot recipe – I can’t wait to try this one and turn it into a PB and jam sandwich! What a delicious recipe! My toddler is going to love this jam on her toast in the morning. Pinning for meal prep next weekend! Is there anything that IP can’t make? 😉 love this way of making jam, so much easier and more convenient than traditional way! Nothing beats a bit of jam on a warm toast! This is a fantastic idea and what a time saver too! I love the idea of not having a bunch of dishes to clean up after I make a recipe. There is noting better than homemade jam. Your fruit combination looks delicious – I would love to have some on my breakfast bagel. These upcoming summer months have home making jam written all over them! And your recipe so easily explains how! Super stoked to get my jam making game on! Thanks so much for sharing :). YUM!! I love making jam in my instant pot!